If you've used Art Authority for iPad, the only reference app winner of Apple's Rewind award two years straight, you should find the new iPhone version to be a great companion app, when you're on the go without your iPad. 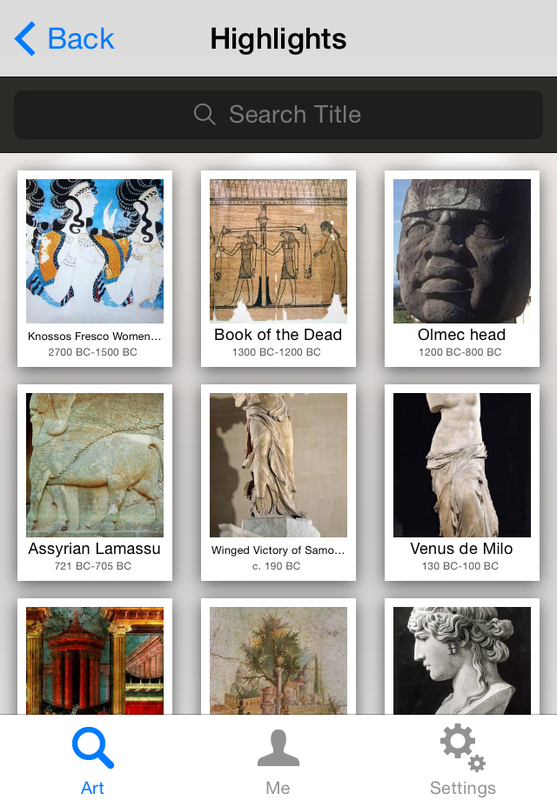 Although its user interface is a bit more limited, it has most of the features you've come to expect from Art Authority, plus a few extra ones we've thrown in to help you locate museums where the art actually resides. If there's a particular iPad (or other) feature you find missing, please let us know. 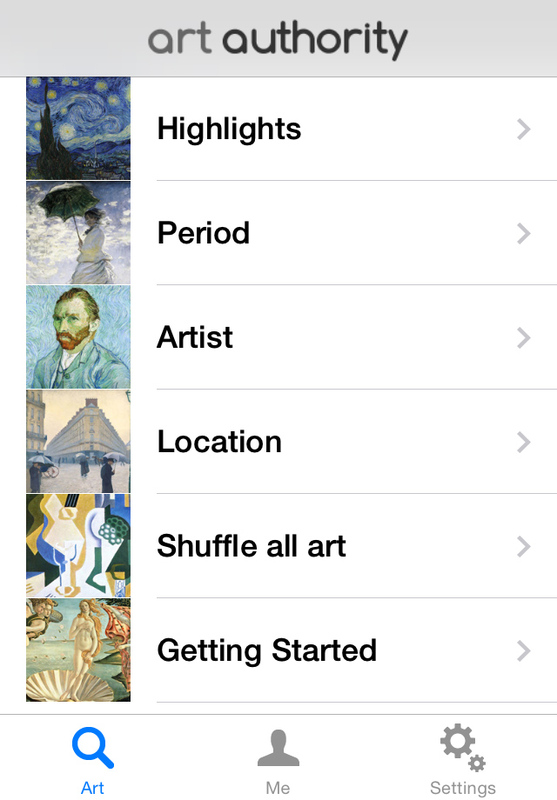 Here's what you need to know to get started using the #1 classic art viewing app on your iPhone. The screen you'll be using most of the time is the Art screen. This screen lists the main ways you can explore Art Authority's 100,000+ paintings and sculptures from over 1500 western artists. The art, which is downloaded over the Internet, is explored in "shows." Highlights - the best of the best. View a show of over 100 of the top works of art of all time. Period - art organized by historic period, plus a special section on American art. Each period includes its own highlights show and then a number of sub-periods. Within each sub-period is a list of associated artists; select an artist to view a show of the art for that particular artist. Artist - all 1500+ artists listed together. Browse or search for a particular artist to view a show of his or her art. Location - 900+ locations of the actual art in the real world. See a street map around the location, get information about the location, and view a show of the works available at that location. Shuffle all art - see a show of a random part of the Art Authority collection. Hit the refresh button for more. A great way to explore the art world as a whole. Art you can by - see a show of all the different works you can purchase reproductions of through the built-in 1000Museums Gift Shop. 1000Museums Gift Shop - enter the 1000Museums Gift Shop directly to purchase archival reproductions of thousands of classic works or art. BUY button - purchase an archival reproduction of the work directly from the 1000Museums Gift Shop. Rewind, next and previous buttons - explore the other works in the show. Play button - sit back and enjoy a slideshow of all the works, complete with music, transitions and other items you can specify through the Settings screen. Tap anywhere to stop the slideshow. 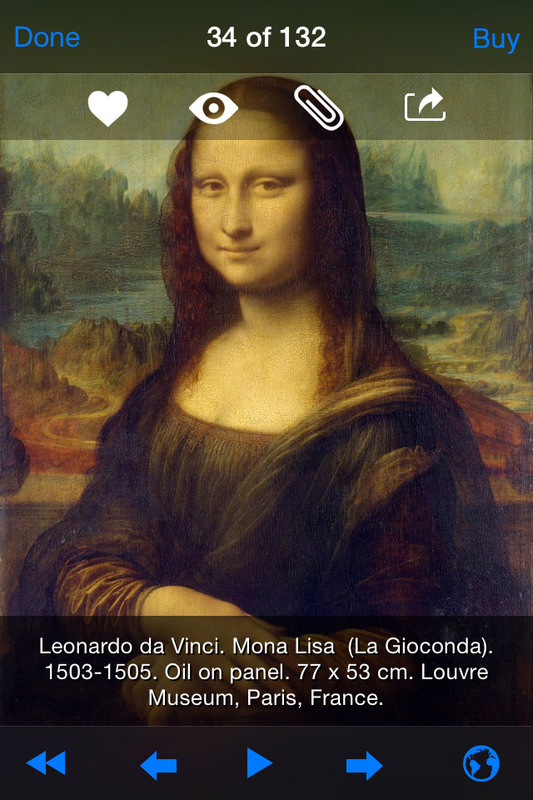 Art Real Size - through the globe button, choosing Art Real Size (when available) lets you immediately see and understand the actual size of the work you're looking at. Using the globe button you can also often learn more about the work itself, the artist, and the work's location, through Web-based articles. You can also jump directly to related shows. For works still under copyright, use the globe button to see the Web site where the image of the work comes from. Sharing and "Me" buttons - near the top of the screen are three "Me" buttons (described in the section about the Me screen) and the standard Sharing button, which lets you share the image by social media, email, or saving it to the Photos app. If the buttons and caption aren't visible in full-screen view, you can always get them back by tapping once. Tap the Done button to return to the thumbnail view. The "Me" screen, accessed through the button at the bottom of the other screens, is where you keep track of items of specific interest to you. Other than "Art Near Me", these items are stored in our server in the cloud, so an account is required, which you can create in the Settings screen. Art Near Me - an intuitive map-based view of the art museums and other sites near where you are, plus a list with the closest ones first. Learn about the site before you go, view a show of the art that's there, even give them a call. 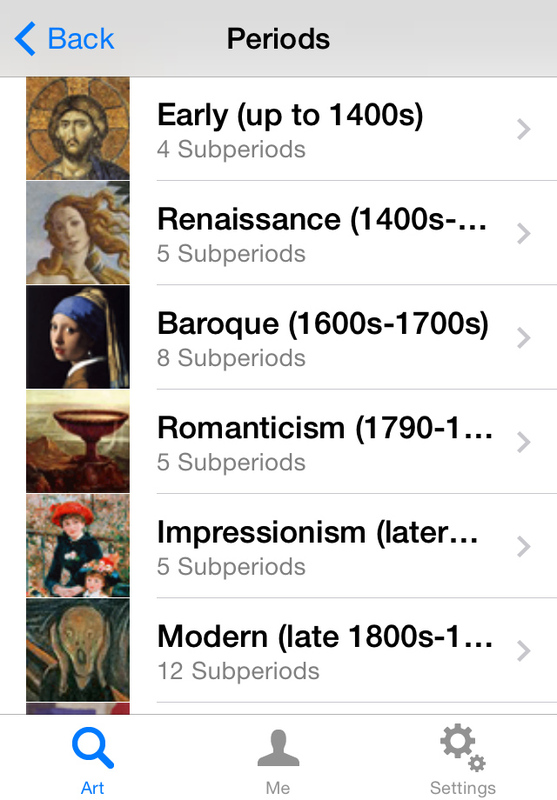 Favorites - your own personal list of favorite works you've encountered within the app. When viewing any work full-screen, just tap the Favorite button to have that work included in a "Favorites" show, accessible here. Works you've seen - your own personal list of works you've seen in real life. 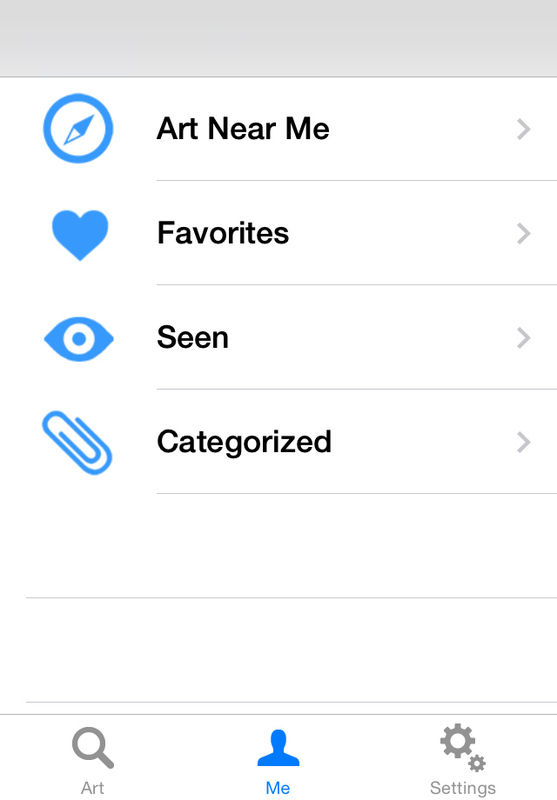 When viewing any work full-screen, just tap the "Seen" button to have that work included in a "Seen" show. Categories - keep track of works in categories. When viewing any work full-screen, just tap the "Categorize" button to set a category for the work, and have it included in a show for that category.